Silks – (also known as aerial contortion, aerial ribbons, aerial silks, aerial tissues, ribbon or tissu) is a type of performance where artists wrap, suspend, fall, swing, and spiral their body into and out of various positions on a suspended fabric without the use of safety lines. Performances are an exciting display of skill, athleticism, coordination and flexibility. Hammock – where aerial silks are hung upside down as a loop of fabric or hammock. Performers may perform inside or outside of the hammock. Back-lighting adds to the ambiance of this performance type. Hammock is recommended for longer performances and shorter spaces (15′ and below) but is also stunning at a greater height. Lyra (Hoop) – A popular aerial form where a steel ring about 36′ in diameter is suspended and performers will hang and create spinning shapes within the circle. This type of performance is lovely as event ambiance as well as a featured act. Straps – Straps are an open aerial form where two ropes are suspended and the performer moves and hangs within. Straps are a fantastic performance at a spinning lower height (20′ and below) as well as event ambiance. 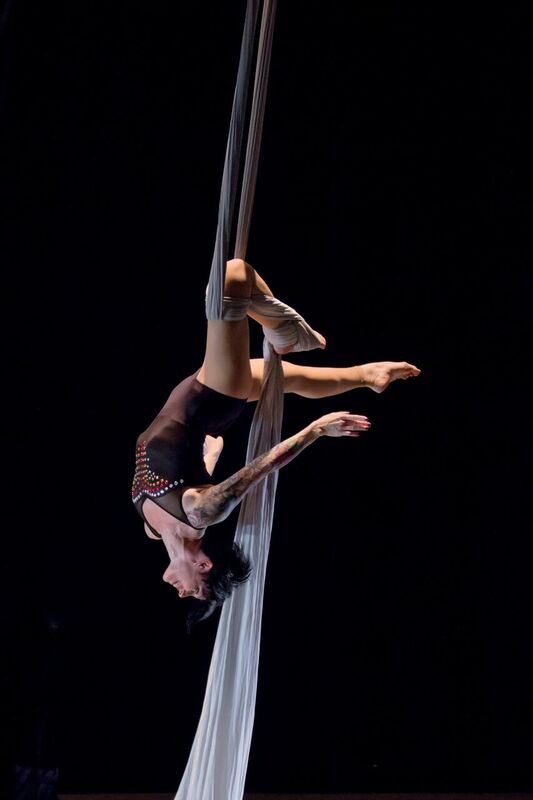 Diamond – An original aerial form created by Voler performer, Nichole Raab. The Diamond is a construct of steel bars that, like the lyra, the performer will hang and create spinning shapes. A popular and unique performance! Net – Net performances are similar to the Hammock, however with the open weave of the netting, a different view of the performer may be seen. We also like to present Sea-based stories and Mermaid tales using the net. Swings – This is the most popular form for aerial ambiance in clubs and bars. Performers will hang, sit and create shapes above the bar or audiences. This is most suitable for short ceilings (12′ and below). Double Swing – Our newest aerial apparatus, the double swing allows for two types of aerial performances at once! 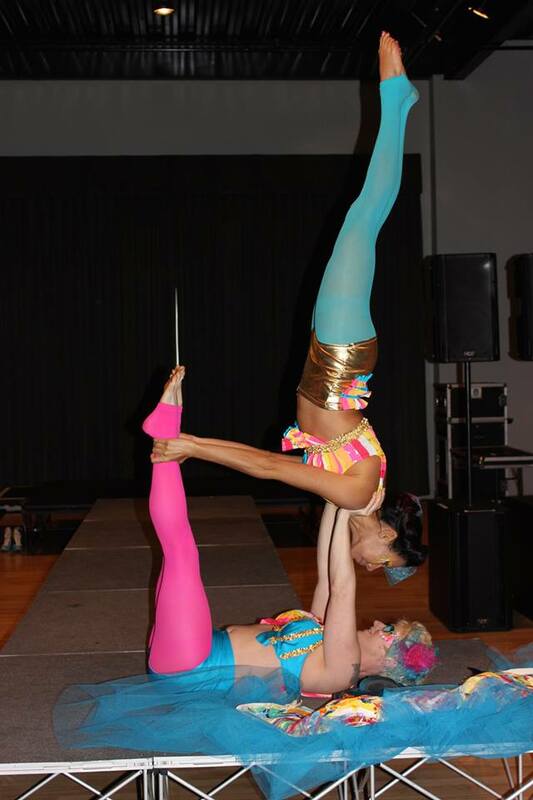 Two performers may rotate around one another as well as perform on their own point. Suitable for lyras, hammocks, straps and silks. Carousel – An original aerial form created by Voler performer, Jade Osborne, fabricated by Machine Head and sponsored by ArtsKC. The Carousel may support up to six performers at once, with multiple uses and options. Aerial silks or hammocks may be hung from the Carousel to add dimension and height to the performance. Ringlet – The mini lyra, created by Voler performer, Lacey Ellington, is a suspended steel ring about 20’’ in diameter. Due to its small size, the performer can incorporate vertical drops from above the ring and flexile shapes from within. It’s a unique alternative to the traditionally larger lyra that is fitting for both ambient and featured acts.